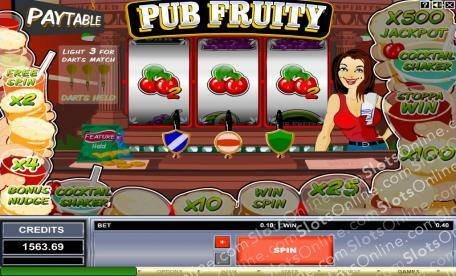 Take a seat at Pub Fruity for plenty of drinks, fun, and a chance to win a whole lotta cash! Click here to play! This unique game is a Fruit Machine, which means there are a few special features that you won’t find in standard slot games. As usual, you’ll spin the three reels for a chance to line up winning combinations across the single payline. However, it also features the Drinks Trail. This trail of colorful cocktails is filled with multipliers and free spins as well as a few special features such as the hold, nudge, stop a win, and cocktail shaker. All of these make it easier for you to bring in the big money wins. Be sure to watch out for the Pub Fruity darts. These little symbols are all over the reels and if you can collect three of them over the course of your gaming session, you will trigger a bonus game. It’s yet another chance for players to bring in even more big money wins. So take your seat at Pub Fruity for your chance to spin the reels and bring in the big bucks. There are a few features on this game that could be considered scatters, though they are not traditional scatters as it is a fruit machine. First is the Drinks Trail that is filled with multipliers, free spins, nudges (allows you to nudge up a symbol to create a win), stoppa win (allows you to pick a multiplier from the drinks trail), cocktail shaker (a random chance to win a prize on the drinks trail) and the hold feature. If you can collect three darts while playing Pub Fruity, you will trigger a bonus feature. During this game, you will play a round of darts for a chance to win up to 1000x your triggering bet.